Playing with your puppy is an important communication and relationship building activity that you can’t afford to miss out on. Many people believe that playing with your puppy is all about being goofy, silly and having a blast, however that is wrong and there is much more at stake when it comes to playtime. What we consider to be ‘play’ in our dogs, is actually a form of language that dogs use to communicate among themselves. Through play they learn to fight and defend and it is an important social interaction; they establish rank (at a younger age, later on this play will change slightly and become more of a form of ritual consisting of basically being annoying to other dogs, entering another dog’s private space, competing for sleeping spots, trying to push out other dogs during feeding time, etc.). Through play they develop drives, instincts and learn about the surrounding environment. This is not as easy to accomplish as you may think, although puppies are all about play, we humans are simply too slow, too predictable, too inconsistent, and above all, too boring. In most cases, what we train our dogs during their puppyhood is to disengage from us, roam around, find sticks, branches, and toys that they can chew on their own, run after leaves, check out any other animals or people and go play with them instead. Although this all looks funny and is a pleasure to watch as this unstable cute little ball of fur explores the world, we often forget that a few months later we will have a grown up dog that will pay no attention to us when we are outside. A dog that will chase moving objects just like he enjoyed (and was permitted) to do as a puppy, he will bolt away to go greet any person or animal on the horizon just to say hi, and what used to be only a few feet of distance for his roaming around will now grow into a few hundred feet from us. It is all about what you train your dog, and by this I mean what you allow him to do (everything is training in a dog’s world, so if you allow something, it will probably reoccur in the future, if you don’t address it). If you allow your dog to jump on people while a puppy, he will do it when he is grown up, the same thing if you allow the behaviors described above, you will end up with a dog that won’t listen to you, which is often when most dog owners sign up for obedience classes as a last resort. Unfortunately, the majority of obedience classes focus on training commands and positions, but these don’t have anything to do with the actual problem, which in this example, is that you and your dog are completely disengaged when outside of the house and all as a result of bad training steps (or no structure at all) throughout puppyhood. There are a few things that you can do in order to prevent problems from happening. This is very important, and will help you in the long run when it comes to creating other schedules later on. Dogs are routine-oriented creatures and this will benefit them. First of all, it will help you put potty time on cue, so as soon as you leave the house you can command your dog to go do his potty, and after the potty is done it will then be ‘fun time’. It is a good practice to first teach your dog to relieve himself before starting play time. Play sessions will be full events where you will not be just a passive observer, but an active participant who will steer the course of the game. 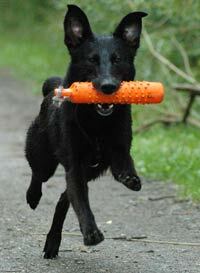 Keep the playing sessions short in order to be presented to your dog in a fun, highly-rewarding way. If you overdo the session, your dog will not enjoy interacting with you, and he may even start avoiding you every time you try playing with him. Change environments and increase distractions gradually so that your dog can get comfortable playing and interacting with you in any environment and under any distractions. This is very important as this will be a basis for any later training and exercises where you need your dog’s focus despite a highly distracting environment. Once your puppy has the item in his mouth, encourage him to go back towards you, tap on your legs with your hands, verbally praise him, and most importantly; move backwards 2-3 steps, this will encourage your dog to “chase you”. Once your dog reaches you, take the ball out of his mouth (don’t create a big fight over it) and repeat the action. TIP: It is important to keep this game down to a few short sessions before your dog gets tired of it and decides to disengage. Also keep in mind that you don’t want to create a big fight over the item, otherwise your dog will start avoiding bringing it back to you, in order to avoid the conflict of losing it. This is by far the best interactive game that you can play with your puppy and it is a very simple one. Take a few treats and simply make your puppy follow you and run with you, change directions by keeping your dog engaged, etc. the possibilities are limitless. If you incorporate this game with actual clicker/marker training principles, you can actually train your dog what specific parts of the playing behaviors and focus that you like. 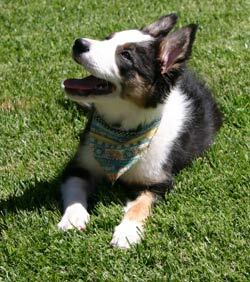 Once your puppy is older, you can incorporate exercises like sit, down, etc. into this exercise. Not to mention, that this is a crucial exercise that will help you establish a better relationship, as it will increase your dog’s responsiveness, and it is the foundation exercise for the proper presentation of the environment and distractions to your puppy. 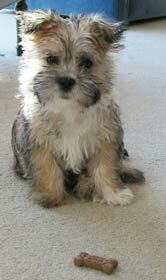 This is described in the Environmental stressors and distractions in puppyhood part of the website. At the early stages of puppyhood, what we do is a lot of prey drive inspired chasing and biting games with the tug, which will eventually establish a toy drive, however, any more serious work with the tug is done after the puppy has changed his teeth. It is also good to note that some dog trainers consider toy drive and prey drive to be the same thing, and interchange these two terms. 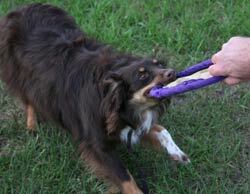 Since playing with the tug is complex, and for many dogs the most rewarding form of play, there is a separate page about it where you can find all of the details about this highly rewarding play. 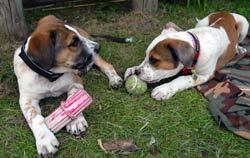 TIP: There is a wide spread belief that playing tug will make a dog aggressive or that it creates a fight for dominance. This is not true however, if this exercise is presented in the wrong way, to the wrong dog, you may end up with a conflict situation. Playing tug with a dog that shows resource guarding behavior patterns may trigger his aggressive response. Please keep in mind that playing the game of tug with a puppy that is younger than 6 months (or puppies that haven't changed their puppy teeth)can be uncomfortable for the puppy's jaw and overwhelming in general. At this stage, a light tugging and chasing game with a piece of rug or piece of leather would be a great pre-learning for later on, when we can use the full potential of this extremely rewarding game.